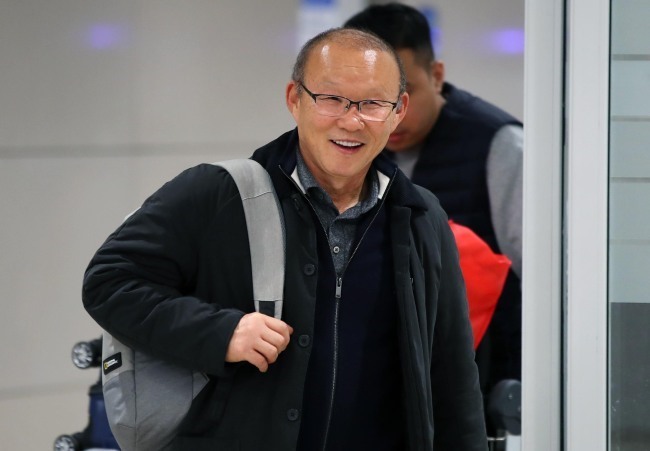 Park returned to his homeland South Korea for a vacation with his family after leading Việt Nam at the 2019 Asian Football Confederation Asian Cup. "After a series of international tournaments, I felt tired," Park told reporters at Incheon International Airport in Incheon. "But we’re off to a good start in 2019." Park’s Việt Nam were eliminated in the quarterfinals at the Asian Cup with a 1-0 loss to Japan. Still, it was meaningful to Việt Nam. Before the Asian Cup, Park said his goal with Việt Nam was to reach the knockout stage. Việt Nam were paired with Iran, Iraq and Yemen in Group D and barely advanced to the round of 16 after finishing third in the group with one win and two losses. The top two teams from each group and the four best third-place teams qualified for the round of 16. Việt Nam were ranked fourth among the six third-place teams at the tournament. In the round of 16, Park’s side edged Jordan, the Group B winners, on penalties and joined the last eight. Việt Nam were the only Southeast Asian team in the quarterfinals this year. "I think we were lucky," Park said of Việt Nam’s Asian Cup performance. "Our players were tired both physically and mentally, but luckily we had a good result." With the latest result, Park continued his miraculous run with Việt Nam since he took over the team in 2017. Park already earned national hero status in Việt Nam after leading the country to a runner-up finish at the AFC U-23 Championship last year. He then guided Việt Nam to the semifinals at the 18th Asian Games in Indonesia, the country’s best-ever performance at the competition. In December, Park achieved another stunning result with Việt Nam by winning the ASEAN Football Federation Suzuki Cup. It was Việt Nam’s first ASEAN title in 10 years. Asked about reasons behind his impressive results Việt Nam, Park said there’s no special method. "The only tournament that I’ve won so far is the Suzuki Cup," he said. "For the Asian Cup, I thought Việt Nam didn’t have big expectations, but when we lost the first two matches, there was criticism. But after we went on to get good results, we saw welcoming reactions." Park also leads Việt Nam’s under-23 team, and he will now have to focus on leading that team to qualify for the 2020 AFC U-23 Championship. However, Park said it’s tough to manage both the U-23 and senior national teams and will pick one of the two in the future. "I have to prepare for one tournament after another, and Vietnamese people are also worried about this," he said. "I may have to make my choice and focus on it. The Việt Nam Football Federation (VFF) is currently discussing this issue." Park will be put in an awkward position in March when Việt Nam face South Korea in a friendly match in Hà Nội. He said a slew of players who are also key members of the U-23 team will not be able to play due to a scheduling conflict but that Việt Nam will try their best. "Việt Nam don’t have a lot of opportunities to face teams like South Korea," he said. "Playing a match against South Korea already gives us a big experience." Park said Việt Nam need a long-term plan for steady development. Despite recent results, he added, Việt Nam are not at the level of top Asian teams. "Some Việt Nam media ask me when the country can advance to the World Cup, but this team needs a lot of time," he said. "I told the VFF that it needs to invest more in youth players who are at least 10 years younger than current members of the national team."